Can’t find the appropriate object for this. The passthru doesn’t show on the 3d grid. The info only has a length and depth but no height. Is there a closer match for this. Number of rooms limit on free plan(beta)? I need to be able to export the larger size images but it says I can’t without a Pro or Business account. How do I upgrade my Plus account? Is there a way to move the grid (or drawing) to align after the drawing is complete? Can I have curved walls? The software was working perfectly. When we logged out and back again a number of pieces of furniture and structural items (steps) were missing. How can we get them back? How can I get the entire size of the combined floor plan? I would like to know the size of the plan to be able to gauge the size of the land needed. How can I save my floorplan as a JPEG. See I can do it in the old version – but nore sure how / where in the new beta version? Many thanks. FURNITURES WON'T CHANGE TO 3D. How do I take measurements out on floorplan – would like to print without (in meters). Tx! 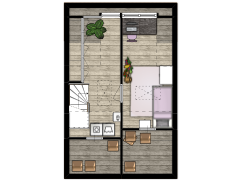 How can I save my floorplan as a JPEG (in beta version). Many thanks! How do i add a second floor? Is there a tutorial of how to do basic functions? When I try to print my floorplan, I get a black bar with a very small 1/2" – 1" icon size floorplan. I’ve tried emptying my temporary files, but that did not change anything. Help? When I send the unwanted information off the page using the Right arrow signs, the page freezes. Damned ! I would like to unblock previously blocked objects and I do not see how! I’ve tried all the suggestions on previous posts. Still am getting nothing but the scale & logo when I print. I need to hand this project in this week!!! I saved my first project, and when I returned to the website, they were no where to be found. It says I have 5 projects, but only 2 are showing up. Please help! Thanks!